If the year 2017 will be remembered as anything, it will be remembered as the year that long waits came to an end, at least insofar as veteran metal band releases are concerned. 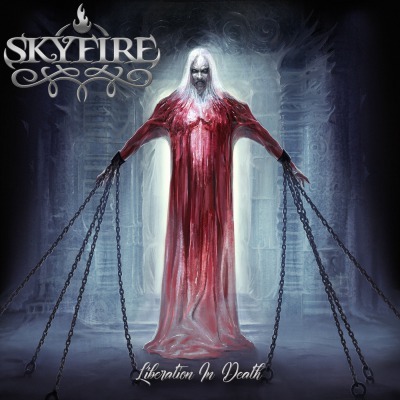 Perhaps among the most long awaited breaks in silence in the world of melodic death metal would be that of Sweden’s Skyfire, who apart from a single song promo put out about five years ago, had been in a state of limbo since their last comeback effort following an extended period of silence Esoteric. With the ongoing studio silence of some other key players in their neck of the melodic death metal woods like Eternal Tears Of Sorrow and Kalmah, not to mention heavy hitters in the Swedish scene In Flames and Soilwork completely abandoning the style, this would seem to be the appropriate time for a band like Skyfire to have a second renaissance and put the lukewarm in the scene on notice with their cold, sorrowful blend of technical keyboard and guitar work, asymmetrical progressive songwriting and break-neck power metal pacing. The question that arises is “Do Skyfire still have the same edge that they had in the early to mid 2000s?”, and for the most part, Liberation In Death answers it in the affirmative. With no backing from a label, this fearsome foursome essentially went it alone in the studio and managed to come fairly close to recapturing the nuance coupled with fits of intensity that were their staple 15 years ago. Production wise, it has a certain smoothness and symphonic flair that is comparable to Spectral, though in terms of energy and animation, it actually hearkens back to the triumphant grandeur and jarring shifts in feel that defined Timeless Departure. The resulting balancing act between the two makes for a collection of songs that are more growers than high-impact affairs, building upon serene keyboard introductions that are almost ambient in character to a high-octane array of blasting and thrashing sections with interwoven lead guitar lines that are a good bit flashier than the typical Gotheburg strain, though similarly as catchy. As odd as it may seem, despite the formula at play here being elaborate and flashy, it does more to reaffirm what this band has already accomplished and even comes off as stylized to the initiated. Particularly in the case of the shortest and simplest offering found on here “Like A Shadow”, the commonality shared with the driving power/thrashing goodness of Kalmah and early Children Of Bodom is difficult to miss despite Skyfire being much more fixated on noodling keyboard lines as thematic material rather than solos, again reminding heavily of the common misnomer uttered back in 2003 of “My favorite melodeath bands are Finnish ones like Kalmah, Skyfire and Children Of Bodom”. The three other songs found on here are a bit more involved and sound less like overt Finnish power metal with harsh vocal work, though “Liberation In Death” and “Realm Of Silence” exhibit some strong power metal vibes and throw out some shred happy guitar solos, while the long-winded “Fading Reflections” hits some chaotic moments that would make The Crown nod in approval. The only real disappointment to speak of here is that this is over after a mere 20 minutes, as everyone with an eye to particular subset of melody and intensity were probably hoping for a full LP after eight years of waiting. Nevertheless, song for song this packs the same level of punch that any select four songs off Esoteric or Mind Revolution would, and the mixture of elements is so varied and well conceived that it feels like there is enough material on here to actually accommodate an album twice as long. More importantly, it comes off as about as overt of a stylistic throwback to the early 2000s as possible despite the greater tendency for bands to really pile on the heaviness between the guitars and rhythm section, which is what most of this band’s core-fan base was hoping to get. It’s not quite the full on majestic masterpiece that Omnium Gatherum delivered up the previous year in Grey Heavens, but it gets fairly close and will hopefully prove to be a preview for soon to come and longer productions. This entry was posted in Death Metal, Power Metal, Progressive Metal, Reviews, Unsigned Reviews and tagged 2017, children of bodom, eternal tears of sorrow, In Flames, kalmah, Liberation In Death, melodic death metal, Omnium Gatherum, power metal, progressive metal, Skyfire, Sweden.